São Paulo, Brazil, 14 March 2018 – A new report, Fostering Effective Energy Transition, published today by the World Economic Forum presents its Energy Transition Index 2018, benchmarking 114 countries according to the current state of their energy systems and their structural readiness to adapt to future energy needs. The report ranks countries on their current energy system performance along three dimensions – energy security and access, environmental sustainability of the system, and potential for inclusive economic growth and development – and evaluates the extent to which enabling conditions that facilitate a low-carbon transition are present. “With this new fact-based framework, we do not only get a view of the performance of national energy systems today but also a much-needed perspective on what is needed to succeed in the future”, Roberto Bocca, Head of Basics and Energy Industries, World Economic Forum. The key finding of this year’s Index is that worldwide progress toward environmental sustainability has stalled, demonstrated by a near-flat trend in carbon intensity: marginal improvement has occurred at only 1.8% a year over the past five years versus the 3% threshold required to achieve the Paris Agreement on climate goals. In terms of affordability, household electricity prices have risen in real terms in more than half of countries since 2013, despite an overall fall in fuel prices. On a more positive note, recent global trends indicate more than 80% of countries registering an improvement in their energy systems over the past five years. However, it also concludes that a new strategy is needed to assist the one billion people currently without electricity. 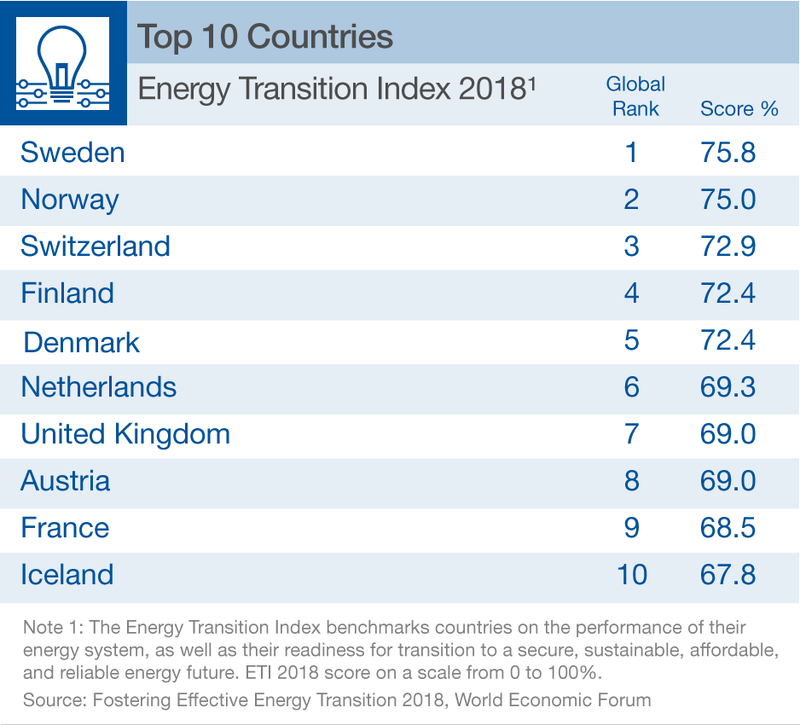 According to the findings, Scandinavian and Western European nations lead the overall rankings, with Sweden, Norway and Switzerland making up the top three. The United Kingdom (7) and France (9) are the only G7 economies in the top 10. Other large economies show mixed performance. Germany (16) faces challenges from high energy prices and rising emissions but has a high level of readiness (11), attributed to strong institutions and regulations. The United States (25) scores poorly on environmental sustainability, but a strong innovation ecosystem, robust institutional framework and vibrant capital markets contribute to a higher readiness rank (22). Colombia (32), Brazil (38) and Russia (70) have well-performing energy systems due to abundant natural resources, but also have low levels of readiness as a result of gaps in human capital and challenges in their institutions and regulatory frameworks. The report identifies countries that demonstrate above average levels of readiness, despite lower rankings on current performance, suggesting the potential to “leapfrog” to more advanced energy systems. These include the Republic of Korea (49), Jordan (65), and Kenya (71). Increased investment in renewables and energy efficiency in the latter, for example, has led to significant expansion in energy access. China (76) also achieves leapfrog status due to recent mandates for electric vehicles and political commitment to addressing environmental challenges, including steps towards the creation of a carbon trading market. Its performance suffers due to its low rank on environmental sustainability. India (78) has improved its performance by making strides towards energy access and reducing energy subsidies. India has taken a series of bold measures, particularly on renewables deployment and energy efficiency, and ranks as an “Emerging Country” that is rapidly approaching the leapfrog category. Fostering Effective Energy Transition, produced with analytical support from McKinsey & Company, concludes with seven steps for an effective energy transition, as well as illustrations of successful experiences and tested frameworks that countries can learn from. Long-term roadmaps with clear imperatives, goals and milestones – and establishment of enablers identified in this framework – are essential for countries to accelerate their energy transition. “Disruption in the energy system is approaching an inflection point and policy-makers, business and society must get ready to capture the opportunities that energy transitions offer. Predictable yet flexible country energy roadmaps are a crucial part of an effective transition that creates value for both business and society”, said Thomas Seitz, Senior Partner, McKinsey & Company. “There is an urgent need to speed up the transition toward more sustainable energy production and use, including reductions in greenhouse gas emissions, greater access to energy and improvements in air quality. To do this we will need to harness a broad portfolio of energy technologies and deepen cooperation between governments, industry and civil society stakeholders”, said Fatih Birol, Executive Director, International Energy Agency and Co-Chair of Stewardship Board, Shaping the Future of Energy System Initiative, World Economic Forum.